New Gator Green In Flux - so pretty but I don't love the style. I would consider a Define in this color, though. New Sweaty or Not line is coming. I kind of like this but bra I'd want it in a solid color. The new Sweaty or Not tank that is already in Hong Kong. This is made of light luxtreme. If it comes in a twelve I'll order it to try since I like luxtreme tops. 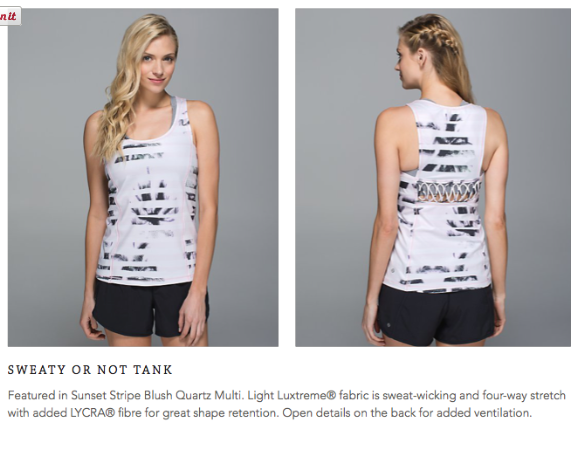 New Sweaty or Not crops. This photo is too dark for me to tell any details. New Sweaty or Not Runsie. 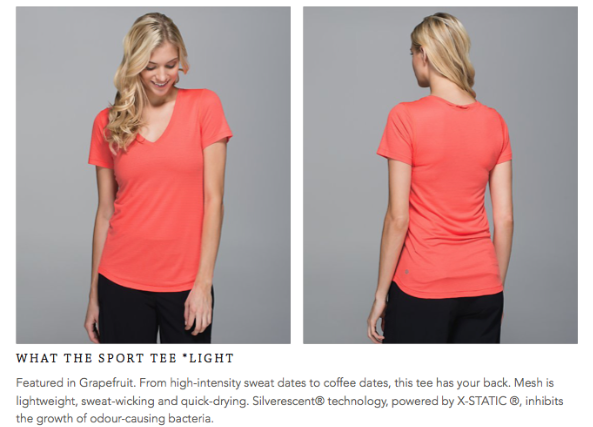 The Grapefruit Mesh What the Sport Tee. I ordered the Blush Quartz on Tuesday and already own a black, which I love. 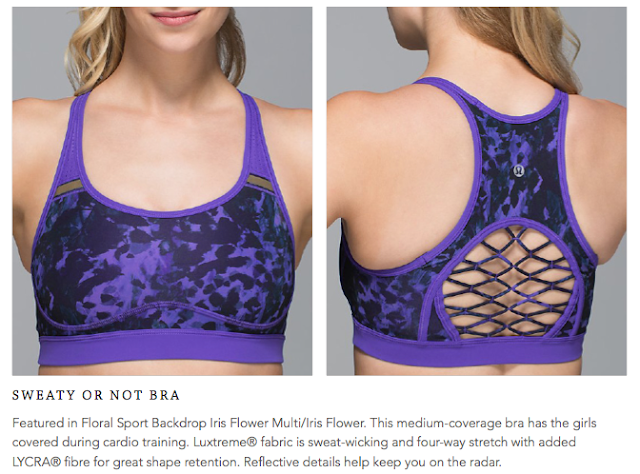 I might need this one, too, since it's such a fantastic run top. New color in Speed Shorts. 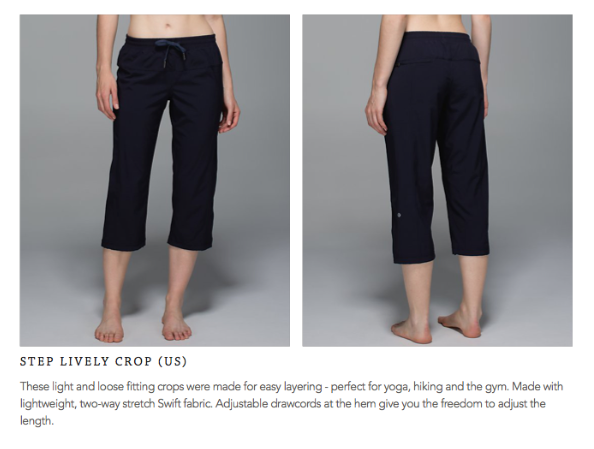 The Step Lively Crops are back - they were last out a couple of years ago. These are made of Swift. Hi LLA, have you seen this? They're killing me with these In Flux jackets. 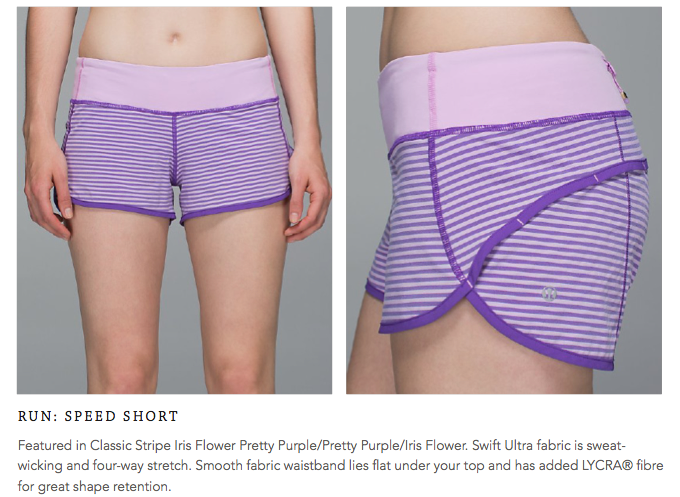 I really like the style and they keep releasing colors I'm sure I really, really need. 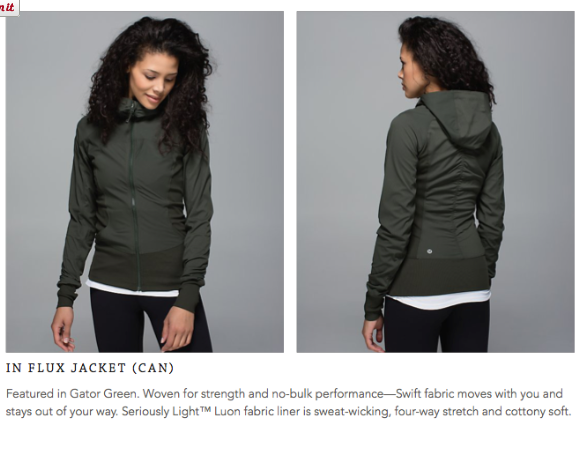 Also, I just bought the gator green studio pants, so if I get the gator green In Flux jacket, I can have a workout suit. Winner! I actually really love the new In Flux Jackets! I like the Gator Green, but already own around five or so of these new jackets now, so I have to think about how much I'd really want it in this colour, because I don't really need it, but would purchase more but only if I really really love the colour and can't do without it. 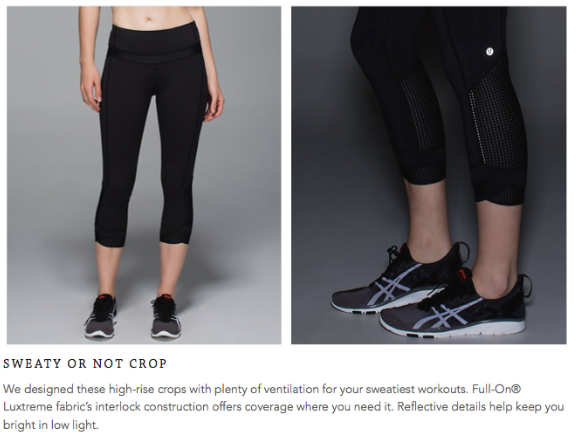 Fit report on the Pace Rival crops -- improvement on the Inspires IMO. Two deep side pockets plenty deep enough for my iPhone 6 without the phone sticking out, rise is higher than the Inspires though not a true 'high rise', length a bit longer than the Inspires (though not a ⅞ length), opaque, good mesh ventilation behind the knee. TTS. Whatever you wear in the Inspires will be the same with the Pace Rival. No longer worried about the Inspires being phased out after trying these on. Bought two pairs. My store had two prints. One shown on your blog LLA and another pretty more neutral print "SPLX/BLK"
@ anon 9:39 am - thank you! I just posted some new photos of some pretty pace rivals in the wee stripe and that other new stipe and have been dying to know how they compare. Hopefully, my store has them today. Re: the pace rivals and the side pocket - are the seams on the pocket bonded? They appear to be in the photo above. These look like great new crops except if they are bonded. Bonded seams can sometimes be sharp and stiff. The in the flux jacket is ok. Otherwise, awesome. Way to NOT get my money LLL. I'm actually starting to like being pushed away from this brand. Still love my CRBs, swiftly tops, older crops and WUs, but not gonna buy any of this new crap.